Revolution gave three factions, made up entirely of audience the chance to try and take over London and save it from the old world powers. With a game built from scratch, you can’t fool the children of this Revolution. Performed at COLAB factory, VAULT festival 2018 & Latitude festival. "you’ll have a great time. Plus you’ll get to establish a socialist utopia. Win-win." "A thoroughly great evening ... as interactive/immersive experiences go, Revolution ranks as one of the best." "a show approaching Punchdrunk levels of immersion but with personal agency that transforms the narrative into the product of its audience rather than that of its creators." "an incredibly off-beat, entertaining affair that is at once funny and thought-provoking, prompting much post-script discussion around the political systems and hierarchy that almost unconsciously come"
In a more and more connected world politics still manages to be something that truly divides us. Revolution gives an audience of complete strangers a fun and engaging way to interact around politics in an action packed game environment. 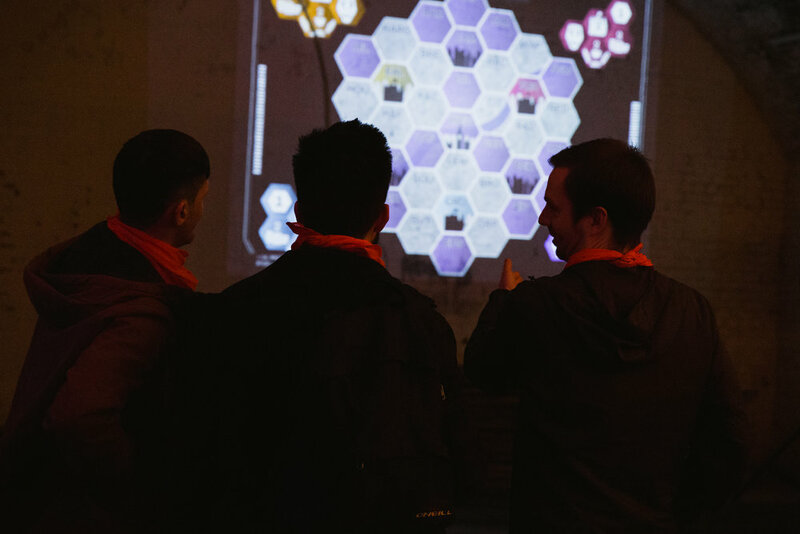 Audiences will find the game aspect of the performance familiar as there are echoes from classic board games but at the same time Revolution is new enough to keep everyone on a level playing field. We use this game format to engage the audience in the tactics of the Revolution. By splitting the audience into three distinct factions we pit audience members (often friends) against each other to try and take over our digital map of London. This leads to alliances, coalitions, backstabbing, spying just like regular politicking. At the same time as placing orders the audience must come up with policies that they wish to see in the new world before they present them to the room and try and defend them. Adding to the gameplay but also engaging an audience in politics without. Testing their ideals and the way that they present them in the forge of public opinion. In a decade where political upheaval has bloomed and disillusionment with existing powers skyrockets, the utterance “we need a revolution” is heard more and more often. This show pushes people to put their money where their mouth is, and enact one. What will you change? Why are you the person to tell the world what would be better? How many people are you willing to cross in order to carry it out? Exit Productions Ltd was created to find the meeting places between Gaming and Theatre, giving the audience the opportunity to be protagonists of the experience. Revolution does just that, placing the audience in the driving seat of the show. Deciding how best to play the game and play the people around them to win the Revolution. "Technology and materials are used wonderfully... the design team deserve a tremendous amount of credit."